Our microwave oven broke, and, being in the cold season, we haven’t replaced it. I figured out how to revive hard, refrigerated rice using steam and time. It came out as good as new. For this article, it’s important to note that the rice was Japanese style rice, probably calrose. It was also prepared as “sekihan”, which is a azuki/red bean and rice dish, which uses a blend of regular white rice and mochi rice, which is glutinous. Whether it’s short, medium, or long-grain rice, refrigeration or freezing will cause the rice grains to become hard and unpalatable. To eat it, the rice must be reheated. It also, usually, needs to have some moisture added back into it. The steamer takes care of both. To construct the steamer, you need a large pot, a small bowl, and a plate. Pour a half inch of water into the large pot. Put the small bowl in, right-side-up, and pour water into the bowl, to keep the bowl from floating. Then, put the plate on top of that, right-side-up. On top of that, put the rice. You can put the rice into a bowl, if you want. Just try to break up the clumps so there’s some airspace, and the food isn’t all stuck to the bottom of the bowl. 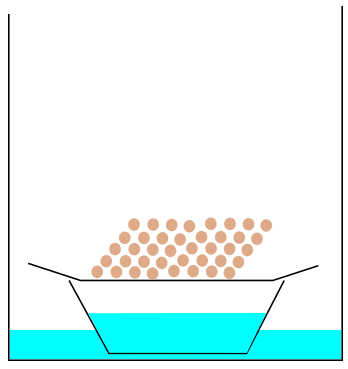 This diagram illustrates the arrangement of water, bowl, plate, and food. Cover the pot with a lid. You don’t want the steam escaping. Turn up the heat to get the water steaming. This takes around 3 minutes. Then, turn the heat to the lowest possible setting, and steam it for 10 to 20 minutes. Eventually, the water will be boiling at a slow simmer, but the food will remain at just below the boiling point. The steam will put water back into the rice, making it taste as good as new. What About the Rice Cooker? The rice cooker keeps the rice at a high temperature, which prevents it from spoiling for one or two days. The texture will change, but the high temperature prevents bacterial spoilage. If you don’t have a cooker to store the rice, it should be cooled, and then refrigerated immediately. Refrigeration abates the growth of bacteria, but, typically, the rice is bad by the third day and should be thrown out. Bad rice has an “off” smell, and a sour flavor. Rice left out around 12 hours will develop this flavor. In desperate times, it’s possible to wash the rice to eliminate some of the spoilage on the rice, and then cook it again, but this doesn’t kill the bacteria B. Cereus, which is one of the toxic bacteria. We are not in desperate times. In old times, there were different techniques to prevent spoilage. Steamers were made of wood, and wood is generally an antiseptic surface. The addition of umeboshi, with the pit, helped preserve rice, possibly because the pit of the ume (apricot) is poisonous. Rice balls were also covered with salty things like pickled mustard leaves, nori (laver seaweed), and kombu (kelp seaweed). This old method of preservation is similar to modern techniques: adding salt, adding mild poisons. Even with these preservative efforts, however, the rice would be “bad” in less than one day — it was “edible”, but considered spoiled and dangerous. That folk-wisdom was probably borne from experience, most likely, with B. cereus.